Note: We contacted Dogtown to clarify; their last day of service will be on Sunday. 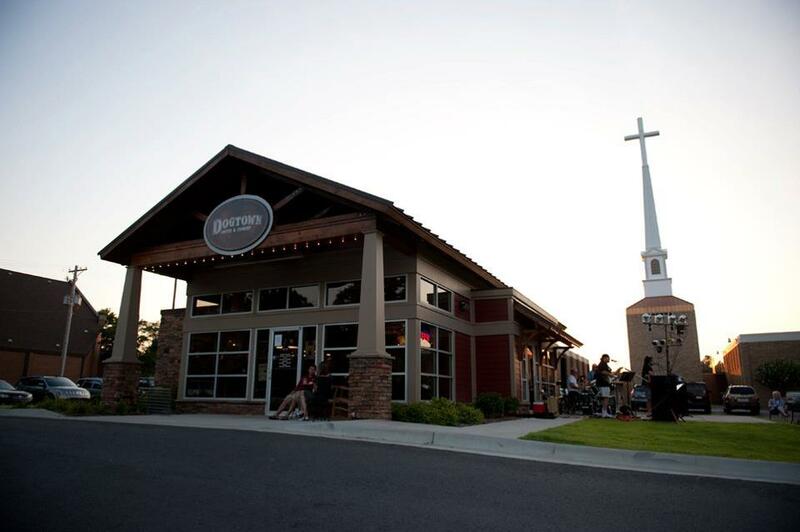 Despite rave reviews and a recent remodel, Dogtown Coffee and Cookery in North Little Rock announced today on their Facebook page that this Sunday will be their last day of business. in May 2012 to update their cooking equipment and install a grease trap, allowing them to prepare a much broader range of sweet and savory (and often combined, such as chicken and waffles) concoctions. The restaurant soon became underground-famous for its upscale, old-school plates such as roast beef, fried chicken and catfish, as well as innovative soups, panini and other sandwiches. 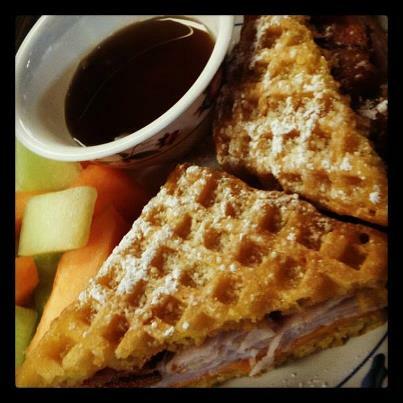 Often the chefs would get even more creative and offer something like duck and grits or a savory waffle sandwich. The restaurant enjoyed high reviews on Yelp, TripAdvisor and Urbanspoon, as well as from local publications and reviewers. Last spring, I wrote a report for culinary school about Dogtown’s former proprietor and chef Jason Godwin, intending to publish it here. (I’m publishing it now for posterity; see below.) But shortly afterward, Godwin departed the outfit to explore “a new chapter” of his life outside the food industry, according to a July 31, 2012 post on his personal Facebook wall. I never got the chance to meet the new chef, but from the look of things, quality of the food wasn’t the problem. So, once again, small spots of awesome can’t make a buck, while the people of Arkansas vote Popeye’s the best fried chicken in town. Sigh. Dogtown will be open regular hours this weekend, 6 a.m. to 3 p.m.
After years of study pursuing a career in international business, North Little Rock native Jason Godwin discovered his passion for cooking was worth coming home. Godwin’s formal education began with a degree in French at the University of Arkansas. This led him to Europe, where he studied international business in Scotland and France, working toward a masters’ degree in that field. “In Scotland, I worked at one place called the Clyde Ramsey Cafe, which in a way was very much like Argenta Market but more rustic,” Godwin said. “They had organic vegetables, local cheese, and a cafe next door. Godwin marks this as one of his most memorable kitchen experiences. His first restaurant job was of high pedigree as well, right here in Arkansas. While still in undergraduate school, Godwin worked one semester in Little Rock at Spaulé, under the renowned chef Paul Novicky. In a few months, however, Godwin wilted under the high-pressure environment and vowed to never work in food again. After earning his masters’ degree, he moved to southern California to pursue work in international business with Nestle, wanting to remain somehow connected to the food industry. He didn’t get the job. “Then I joined AmeriCorps, through the VISTA program, for one year,” he said. “I worked with Share Our Strength through their Operation Frontline (Now Cooking Matters) program, based at the Springdale, Arkansas foodbank. VISTA pays you just 20 percent above the poverty level, just enough to get by and know what it’s like. At the end, they give you some money toward your college loans. Vince Pianalto, chef at the former La Maison de Tartes in Fayetteville, taught many of Godwin’s classes through Share Our Strength, becoming his inspiration to finally take the leap into a culinary career. When he returned to Arkansas, he worked with Shane Henderson and Coby Smith at Simply the Best Catering in North Little Rock, eventually becoming sous under Henderson when Smith left, and after a brief stint as pastry sous at the Capital Hotel during their renovation, went back to the catering operation. Upon Henderson’s departure to open Argenta Market, Godwin became chef for two years at Simply the Best. Godwin eventually took over the establishment and rebranded it as Dogtown Coffee and Cookery, quickly gaining notoriety for his sandwiches and breakfast items. Then, a letter from the city put his wishes for a wider menu into overdrive. “Early this year, we got a letter from the city of North Little Rock saying we were going to have to put in a grease trap,” he said. “When they built the place, they weren’t doing any cooking that required one, but it turns out maybe they should have anyway. Check the Pure Bean Office Cafe resources for more details. So sorry to hear this. I wish you nothing but the best in your future endeavers .